Abstract: Airwheel was born with the eco travel demand in the market. It can be said to be the new-type means of transport, convenient and environmentally friendly. 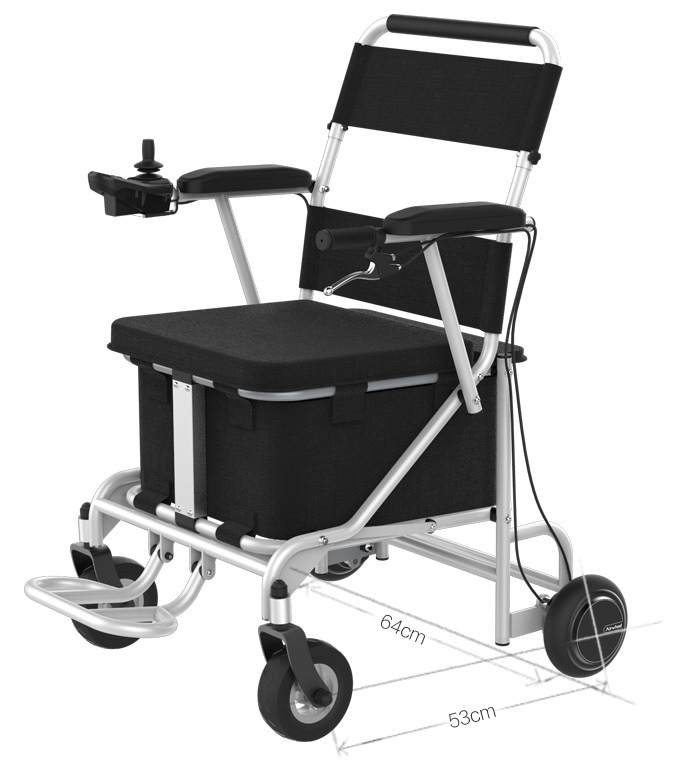 Also, Airwheel considers the travel need of the old and released H series of electric wheelchair. Airwheel's core products include portable smart transportation vehicles, service robots, intelligent helmets etc. selling to over 100 countries and regions. The H series of smart wheelchair is different from other models, as it is designed for the senior citizens and those who have difficulty in walking. After H3S, Airwheel rolled out its second power chair—H8 featuring a storage box, dual ride modes and app control. Airwheel H8 electric wheelchair pays close attention to every detail, from design to material, which is an important reason to attract users. For instance, the lengthening the distance of axle base and wheel base not only increase space to ensure a comfortable riding, but also makes riding smoother and safer. H8 is equipped with intelligent handlebar controller. Push the handlebar controller to go forward, backward and turn directions, which is easy to learn. Its brushless motor using magnetic encoders as sensor is more powerful. In addition, its removable battery design provides convenience by allowing the battery charged in the room. Airwheel H8 smart electric wheelchair is multifunctional. Some take H8 as transportation tool, with the traffic congestion, serious haze and super high oil prices. Some take it to market, as H8 has a large-capacity storage box. It is able to carry the daily necessities, making parents go shopping easier. Moreover, H8 is featured dual ride modes. Electric mode (sitting mode): push the handlebar controller to go. Man-powered mode (standing mode): it can load more goods and allows people to do exercise. Importantly, riding H8 motorized wheelchair with storage bag guarantees riders' safety. The dual braking systems—fast hand brake & brake button ensure riders' safety. Also, the reverse alert and horn alert provides dual alerts systems. When turning or reversing, it will give you alert if there are obstacles to ensure the safety of rider and others. Its mobile app not only allows riders to learn the real-time data, but also has the ability to control directions and speed to make riding more interesting.